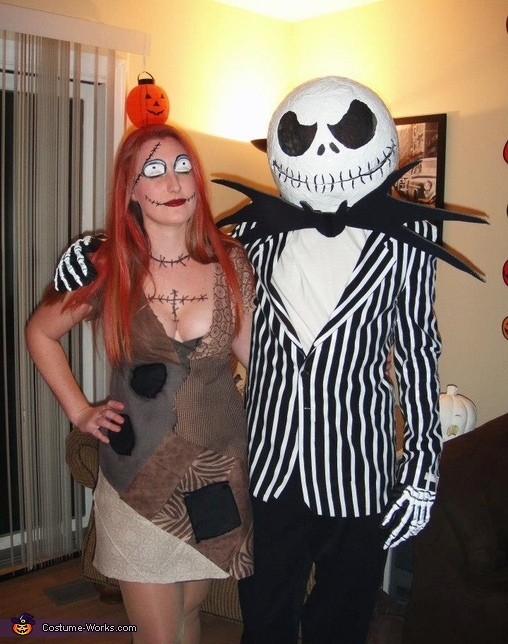 My boyfriend & I love the movie Nightmare Before Christmas. We also love Halloween and thought it would be fun to dress up as our favorite characters. For Sallys costume, I used random fabric and spray glued pieces onto a dress I already owned. I did my own make-up & used temporary red hair dye. For Jacks costume, my boyfriend bought a suit jacket from the thrift store and used thin white tape to make the stripes on the costume. He made the mask out of paper mache & cut the eyes and mouth out. He used black screen to cover the eye holes. The bat bowtie is made out of cardboard and spray paint. He also bought skeleton gloves online.